It was a moment of vindication for the David S. Wyman Institute for Holocaust Studies, which in its ten years of existence has labored to persuade government officials, the news media, and the general public that the lessons of America’s response to the Holocaust are relevant in today’s world. Now the secretary of state himself was arguing, before the Senate and the world, that the fate of the infamous refugee ship St. Louis in 1939 was a reason for the United States government to undertake military action in the Middle East to save innocent civilians. America’s record during the Holocaust is relevant, after all. When Professor David S. Wyman was working on his magnum opus, ‘The Abandonment of the Jews,’ in the late 1970s, most Americans still idolized President Franklin D. Roosevelt. He was revered as the president who had led America out of the Depression and to the threshold of victory in World War II, before tragically dying in office. Revelations about the personal lives or private conversations of several other presidents had brought them down a notch or two in the public’s eye, but the image of FDR had remained largely unscathed. ‘Abandonment’ changed all that. For the first time, large numbers of Americans were faced with indisputable historical research laying bare the extent to which Roosevelt knowingly turned away from the Nazi genocide. The immigration quotas that were almost never filled … The troop supply ships that returned to America empty, instead of carrying refugees … The administration’s suppression of news about the massacres … And most of all, the refusal to undertake militarily feasible bombing raids on Auschwitz and the railway lines leading to it. The painful facts had been uncovered by a Harvard-trained historian, a Christian who himself had been an unstinting admirer of FDR–until he discovered the truth. ‘The Abandonment of the Jews’ transformed the way Americans perceive Franklin D. Roosevelt and the U.S. response to the Shoah. But no book can hold the public’s attention indefinitely. By the late 1990s, Prof. Wyman had retired from the public arena. Numerous Holocaust museums had been established, but their exhibits had not always kept pace with the latest research–for example, the United States Holocaust Memorial Museum, in Washington, D.C., which opened in 1993, did not mention the Bergson Group, the Jewish activists whose protests had forced the Roosevelt administration to belatedly take some steps to rescue Jewish refugees. Even worse, professional partisans were entering the fray–officials of the Franklin & Eleanor Roosevelt Institute, in Hyde Park, NY, launched a vitriolic public campaign against critics of FDR’s response to the Holocaust. (At one point, its president actually sent Prof. Wyman and this author a note accusing us of “peddling hate as though it were history.”) By 1996, FDR’s cheerleaders succeeded in pressuring the U.S. Holocaust Museum to alter a text in its permanent exhibit that had criticized the Roosevelt administration’s refusal to bomb Auschwitz. It was clear there was a need for a new institution, one that would carry on Prof. Wyman’s work, by encouraging new research on unexplored aspects of America’s response to the Holocaust; by helping museums correct inaccurate exhibits; and by finding innovative new ways to teach the lessons of the 1930s-1940s–especially to young people. The David S. Wyman Institute for Holocaust Studies, established in 2003, was especially determined, from the outset, to shine a spotlight on those Americans who had not abandoned the Jews. “They Spoke Out” became an enduring theme of the Institute’s work precisely because the activists of the 1940s had been so neglected. Four hundred rabbis had marched to the White House in 1943, the only protest in Washington, D.C. for rescue from the Holocaust–yet they were not mentioned in history books. The Bergson Group had sponsored rallies, placed hundreds of newspaper ads, and lobbied extensively on Capitol Hill (it was really the first “Jewish lobby”) –yet it was not mentioned in Holocaust museums. Journalist Varian Fry and rogue U.S. diplomat Harry Bingham smuggled over 2,000 Jews out of Vichy France–yet their names were almost completely unknown. A handful of courageous American athletes risked their careers by boycotting the 1936 Berlin Olympics–yet they were forgotten. Ten years later, the landscape has changed, thanks to the Wyman Institute’s appeals, petitions, and educational efforts. The U.S. Holocaust Museum finally installed materials about the Bergson Group –and a photo of the rabbis’ march– in its permanent exhibit. Numerous recent Holocaust history books and reference volumes have also mentioned Bergson and the rabbis’ march. Yad Vashem hosted a joint Wyman-Yad Vashem conference celebrating the 70th anniversary of the Bergson Group’s creation. Former Speaker of the House Nancy Pelosi praised the Bergson Group, in her recent autobiography. The Chicago City Council agreed to name a street after Ben Hecht. Harry Bingham was honored with his likeness on a U.S. postage stamp. The boycotters of 1936 have been honored at numerous events in the Jewish community, and their children and grandchildren followed in their footsteps by taking part in human rights protests related to the 2008 Olympics in China. The Institute’s goal was not merely to attain overdue recognition of these men and women–but to present them to today’s younger generation as moral role models. The goal was to inspire today’s students–tomorrow’s leaders–to avoid the mistakes of the Roosevelt era. Hence the Wyman Institute’s collaboration with Disney Educational Productions on a DVD, just released this summer, called “They Spoke Out: American Voices Against the Holocaust.” It features six 12-minute ‘motion comics’ episodes, blending cartoon animation with authentic newsreel footage and photographs. The episodes focus on stories such as the voyage of the refugee ship St. Louis; Varian Fry’s rescue mission; Mayor Fiorello La Guardia’s campaigns against the Nazis; and the Polish underground courier Jan Karski, who risked his life to bring news of the Holocaust to the Free World. The Karski episode was recently translated into Polish and is being used in high schools throughout Poland. In this vein, the Institute’s next project is a book called Cartoonists Against the Holocaust, showcasing over 100 editorial cartoons from U.S. newspapers in the 1930s-1940s that tried to alert the American public about the persecution of Europe’s Jews. Intended both as a school textbook and for the general public, Cartoonists Against the Holocaust enables readers to view the events of those years through the eyes of the nation’s leading political cartoonists. It includes cartoons by Herbert Block (“Herblock”) of the Washington Post, famed Polish Jewish refugee artist Arthur Szyk, and Dr. Seuss, who was an editorial cartoonist before he began writing children’s books. Everyone worries about how Holocaust education will be impacted when there are no longer survivors to talk about their experiences firsthand. To that end, Stephen Spielberg and others have done invaluable work in videotaping interviews with those who experienced the Holocaust. But who will record the endangered eyewitness testimony of the activists of the 1940s, and others connected to America’s response to the Shoah? The Wyman Institute has conducted a series of interviews with rabbis who took part in the 1943 march. The Institute has also interviewed numerous Auschwitz prisoners who saw American planes flying overheard in 1944 (on their way to bomb German oil factories adjacent to the camp). The cochairman of the Institute’s board, Sigmund Rolat, and filmmakers Stuart Erdheim and Chaim Hecht, flew to South Dakota to conduct a landmark interview with former presidential nominee George McGovern, who was one of the U.S. pilots on bombing raids near Auschwitz. McGovern sharply criticized President Roosevelt’s failure to order the bombing of the death camp or the railways leading to it. The Institute screened the interview at a hearing of a Congressional task force. Wyman Institute researchers also uncovered documents exploding the Roosevelt Institute’s claim that David Ben-Gurion and many other Jewish leaders opposed bombing Auschwitz (for fear of civilian casualties). The U.S. Holocaust Memorial Museum, after weighing the evidence, agreed with the Wyman Institute that Ben-Gurion, Golda Meir, and other Jewish leaders in fact supported, and lobbied for, bombing the death camp. Facing up to the mistakes made in the 1930s and 1940s is a crucial step in the process of learning lessons from the past. Just weeks after the Wyman Institute was launched, England’s largest publisher, IPC, ignited a controversy by prohibiting a journalist’s website from reprinting a puff-piece about Adolf Hitler’s summer home that its “Home & Gardens” magazine published in 1938. “The Fuhrer has a passion about cut flowers in his home, as well as for music,” the article gushed. It was a prime example of how the media soft-pedaled Hitler in the 1930s. The Wyman Institute threw down the gauntlet, posting the article on its own site and organizing a petition by 70 Holocaust scholars. IPC backed down and apologized for trying to suppress the article. Three years later, American publishers were the ones in the docket. Northeastern University professor Laurel Leff, a member of the Wyman Institute’s Academic Council, uncovered documents showing that in the 1930s, U.S. journalism schools refused to hire German Jewish refugee journalists and the American Newspaper Publishers Association refused to give a Harvard professor ten minutes at their convention to speak about the refugee journalists. A petition organized by the Wyman Institute asked the newspaper publishers to acknowledge their moral failure in the 1930s. It was signed by 80 leading journalists and editors, including New Republic editor in chief Martin Peretz, Marvin Kalb of ‘Meet the Press’, and Columbia Journalism School dean Nicholas Lemann. The newspaper publishers publicly apologized for their actions in the 1930s and invited Prof. Leff to address their board of directors. The Wyman Institute has taken the old-fashioned concept of a petition and revamped it into an educational tool with considerable impact. In 2004, the State Department blocked legislation by Congressman Tom Lantos to appoint a U.S. envoy to monitor antisemitism around the world. A Wyman Institute petition signed by more than 100 public figures –including former ambassador Jeanne Kirkpatrick and former vice presidential nominee Jack Kemp– charged that State was repeating its behavior in the 1930s, when it tried to play down the danger of worldwide antisemitism. Embarrassed by the publicity from the petition, the State Department backed down and the Lantos bill passed. 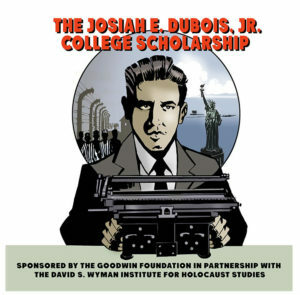 A 2005 Wyman petition signed by over 600 scholars persuaded CSPAN to cancel a planned broadcast of a lecture by Holocaust denier David Irving. The following year, a Wyman petition signed by 30 rabbis who had recently met with King Abdullah of Jordan convinced the Jordanian government to cancel an antisemitic, Holocaust-denying television series. More recently, a series of Wyman petitions –by Holocaust scholars, Jewish leaders, clergy members, and other constituencies– have drawn attention to the international community’s failure to act against Sudanese president Omar al-Bashir, who has been indicted by the International Criminal Court for genocide against non-Arab tribes in Darfur. The protests have unexpectedly made the Wyman Institute one of the best-known advocates on issues related to Darfur. That may not have been precisely what was on the agenda when the Institute was first established ten years ago–but it’s very much consistent with the Institute’s ultimate raison d’être: teaching the lessons from America’s response to the Holocaust, so that the tragic silence of that era will never be repeated. Previous Post:75 Holocaust Scholars Urge Obama: Arrest Sudan’s President if he comes to U.N.
Next Post:Free the “Genocide Rug” !